Broccoli belongs to the cabbage family and it is its large flowering head with its multitude of florets that’s most often eaten. High in vitamin C and fiber, broccoli is also reported to contain potent amounts of nutrients that protect the body against carcinogens. – Eating broccoli raw? Crisp it by soaking it in cold water for 10 minutes. – The stem and leaves can be eaten – cut and stir fry. Makes a good addition to soup stock too. Look for dark green florets in tight heads and firm stalks. There should be a heavy feel for its size. The cut ends should be fresh and moist looking, never dried out or brown. Store unwashed in an open plastic bag in the refrigerator, the key is to not let moisture accumulate. 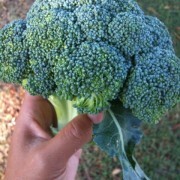 Very fresh, locally grown broccoli can keep up to a week.